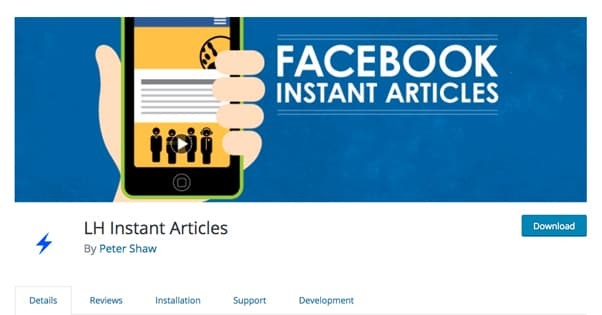 Facebook Instant Articles are a system Facebook has had in place for publishers to put their content, mostly blog posts, directly on the Facebook platform. This comes with a few advantages and a few disadvantages. Are you interested in using the system? I’m going into this assuming that you already want to use Facebook Instant Articles, but if not, let’s talk a bit about them before we begin. 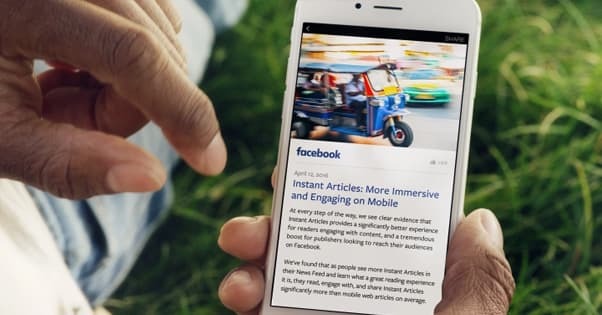 Using Facebook Instant Articles has a few benefits and a couple of noteworthy drawbacks. 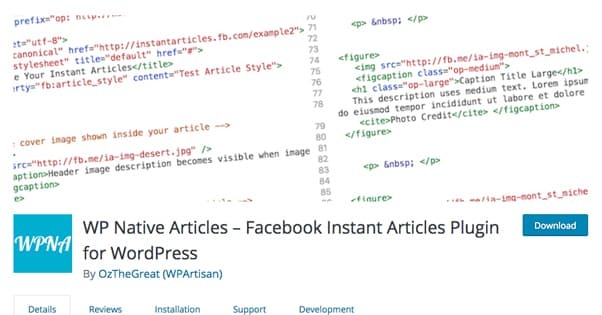 As far as benefits go, Instant Articles are hosted on the Facebook domain and servers. This means, like content on a CDN, they load basically immediately no matter what kind of connection the user is using or what device they’re on. They automatically work very well with both desktop and mobile platforms. They look good, too, and are clear to read and navigate. You don’t have to worry about duplicate content issues or only posting unique content to Instant Articles, either. Facebook requires you to publish the post on your website, and it hosts an instant copy of the post as an Instant Article. To avoid duplication issues, they use rel=canonical tags to canonize your original blog version. Instant Articles include an author byline and allow you to add links the same way blog posts do. 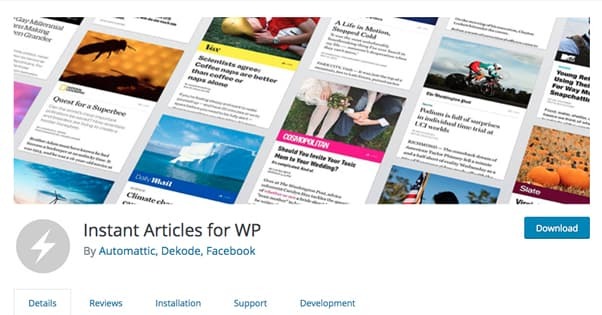 You can also use them as a publisher hub for Facebook ads via their display network. This means you can monetize Instant Articles. On the other hand, this system is not without drawbacks. First and foremost, you lack complete control over the content and, more importantly, the navigation surrounding it. You can’t use pop-overs, overlays, Hello Bar-style shutters, sidebars, or even social sharing buttons beyond the Facebook share button that FB adds. This is a huge drawback if you use your blog to generate eyes on your calls to action, referring users to landing pages and converting them into customers. If you want to direct readers to your landing pages via an Instant Article, you’re going to need links in your content itself, which is often considered poor form. Also, while you can make some money with Instant Articles, you also open your content up to Facebook ads that you don’t necessarily control. You could find ads on your content advertising a direct competitor. I don’t know offhand how much ability you have to blacklist brands or domains, but it wouldn’t surprise me if you’re left at the whims of Facebook itself. Perhaps the biggest factor in the decision of whether or not to use Instant Articles is this: do your users click through your links? An article hosted on Instant Articles will load faster and be easier to read than most instances of content on your site. This is triply true if you don’t have a mobile version of your site. Though, to be honest, if you don’t have a mobile version if your site yet, stop reading this article right now and go make one. You’re losing 10,000% more traffic by lacking a mobile site than you could potentially gain from Instant Articles. Facebook specifically recommends one particular plugin for this process, but I’m providing four other alternatives as well. Regardless of which plugin you use, you need to have some other elements before you begin. First of all, you need a WordPress site. Obviously, you can’t use a WordPress plugin if you’re not using WordPress. You’ll also need a Facebook Page – not a profile – and you’ll need to sign up for Instant Articles. The sign-up form is here. You will need at least five pieces of published content on your site before you can sign up, and you need a logo for your publication. 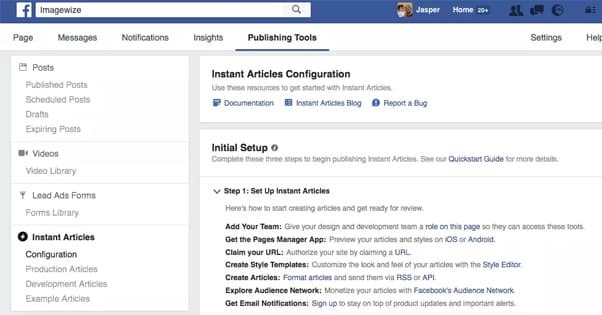 Facebook also recommends using the Page Manager app to help you manage your Instant Articles on the fly. At this point the process is simple. Register for Instant Articles and install your choice of plugin below. Go through the configuration options as presented by the plugin of choice. You will need your Facebook Page ID, which can be found in your Instant Articles Configuration menu. If you have any other questions, feel free to ask in the comments and I’ll see if I can help. Now, though, let’s get on with the plugins! 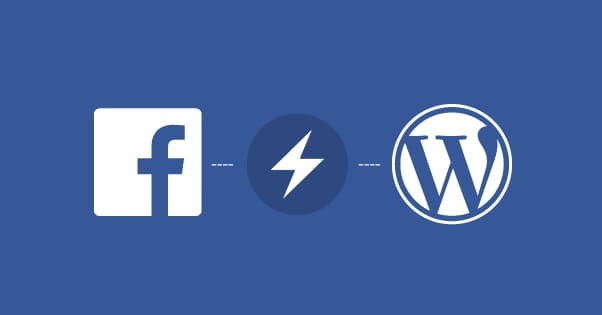 Also known as FB Instant Articles, this is the official Facebook-developed plugin for porting your blog content over to Instant Articles. Given that it’s Facebook-developed rather than custom created by a third party, it’s somewhat limited in features and has a lot of negative reviews. As such, it’s sitting pretty at 2.5/5 stars in the WordPress plugin directory. In fact, this plugin is only on this list because it’s the one Facebook links to directly, meaning it’s the one you’re most likely to encounter first. Basically every single review this plugin has gotten in the last two years is a one-star review. From what they say, it looks like Facebook pushed an update to their site, and the developers of the plugin lagged behind, and pushed a half-assed plugin update that leaves some features broken, makes porting content inconsistent at best, and generally barely functions. If you’re really worried about the basics of plugin installation and are following Facebook’s step by step installation guide, you can use this plugin. Otherwise, use something else; the hassle isn’t worth it and the support is nonexistent. First of the alternative plugins, this one was developed by WPArtisan, also known as Oz the Great. Unlike the official plugin, this one comes with a bunch of additional features and useful integrations. For example, it supports code from WP Recipe Maker, Jetpack, Google Analytics, and others. This plugin also has a perfect 5 star rating, which is impressive considering the one Facebook created has a 2.5 stars. Perhaps the most important item this plugin brings to the table is their most recent major release with Content Transformers. Everyone who has used Instant Articles in the past has no doubt encountered a time when the direct port of the article broke something. Maybe Unicode symbols display wrong. Maybe a link is broken or an image doesn’t work right. Regardless of what is broken, Content Transformers can fix it. Essentially with Content Transformers, you’re creating a find-replace rule. The transformer will scan your post in between publication and port, looking for any common issue you have spotted. It will then make whatever change you specify. Of course, in order to use this, you need to identify the cause of an error and implement a consistent solution. This means seeing the error more than once and identifying a fix that works every time. Otherwise, you might as well just make manual edits. This plugin has a Pro version you can purchase if the free version isn’t good enough for you. It includes more advanced API links to additional services, including crawlers, Placement Manager, Mass Post Syncer, and more. It also gives you article error status updates, managed publication and article manipulation, and premium support. A single site license will run you $49 per year. This is a small and very simple Instant Articles plugin developed by Khromov and Titanas. Don’t worry, those names don’t mean anything to me either. It’s a very simple plugin aimed at getting Instant Articles up and running with as little overhead as possible. Unlike Native Articles above, it lacks any advanced configuration, content filtering or manipulation, or error reporting. All it really does is lets you configure some DNS prefetching and can give you sticky posts. This particular plugin has good reviews, but it also has very few reviews. It has very few installs, for that matter, less than 1,000 in the wild today. It’s also over two years old and, as the banner across the top states, has not been tested with the most recent three major releases of WordPress. Some features may or may not work, and it’s up to you to find that out, because no one else has tested it. This is where my usual disclaimer comes into play. Any plugin over six months old should be considered a potential security hazard. WordPress is an extremely popular platform, which means there are absolute tons of bots and hackers going around looking for any possible vulnerability. Many bots will simply try common, known vulnerabilities and see if they get in. Using an out of date plugin has the potential to open you up to vulnerabilities. If the plugin makes use of code or a feature that has a known issue, and it hasn’t been updated to fix the security hole, using the plugin can potentially put you at risk. Always exercise caution. Now, I’m not saying that this particular plugin is going to be a security hole. I’m not a WordPress hacker, I don’t know what is and isn’t an open vulnerability right now. All I’m saying is to be careful, and if possible, use a more up to date plugin. This Instant Articles platform was developed by Peter Shaw. Think of it as an alternative to #3 on this list. It’s an extremely simple, lightweight implementation of Instant Articles. As near as I can tell, it was essentially developed by Peter for his own use and uploaded just in case anyone else wanted a very lightweight option. It support posts, basic analytics, and ads, and it has a few hidden advanced features. When I say hidden advanced features, I really mean it. The advanced features come in the form of filters, all of which are only available by editing comments in the code of the plugin itself. If you’re not confident in doing so, I recommend leaving it alone. You can do your publication and manipulation with the Facebook Page app instead. As far as stats for the plugin go, it’s pretty small scale. It’s relatively up to date, having been updated seven months ago as if this writing. It has a meager 600 or so active installations, but has been tested to work with the recent versions of WordPress. It also integrates with Peter Shaw’s other LH plugins. Shaw has a couple dozen other plugins, most of which have only a dozen or so users, and replicate features of other plugins in a lightweight way. You can see his full list here. 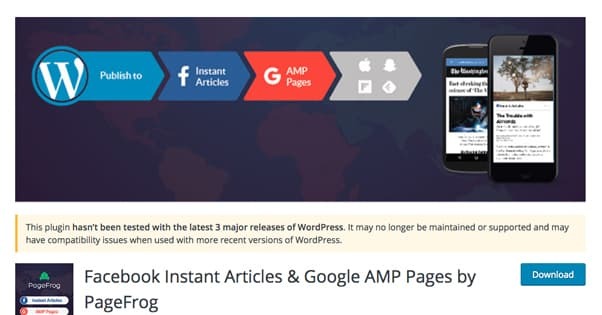 Also known by the convenient name Facebook Instant Articles & Google AMP Pages by PageFrog (FIAaGAMPPbPF for short), this is one of the more versatile, fully featured plugins available for Instant Articles. For one thing, this plugin does more than just Instant Articles. 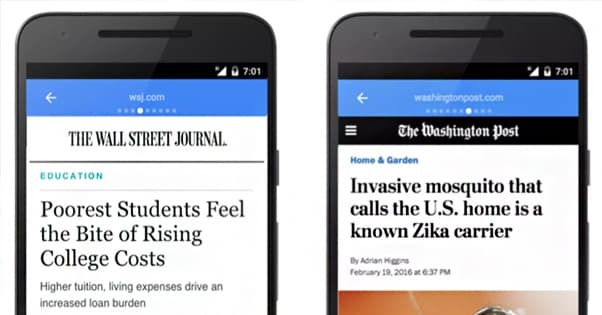 As the title implies, it also allows streamlined publication on Googles Accelerated Mobile Pages platform. It includes full support for both platforms, for publication, advertising, and analytics. It’s also one of the only plugins available in languages other than English. It’s one of the slickest plugins for this purpose, with a nicely designed UI. Unlike Native up above, this plugin does not have a premium version. In fact, Native is the only entry on this list that gives you a paid version. Yet, despite this, I would still say Native is the best. Unfortunately, there are a few drawbacks to this plugin. First and foremost, it’s also a long out of date plugin. 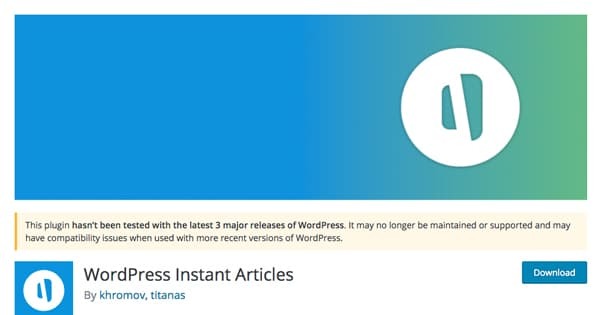 It has over 10,000 active installs, but it hasn’t been updated in three years and hasn’t been tested on the most recent three or four major WordPress releases. As I mentioned up above, this is a security risk, and it means that some features don’t work and it’s fairly unlikely that the plugin will receive any updates in the future. Use it if you want, but use it at your own risk. 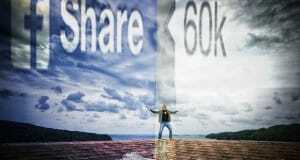 Which Social Plugins Support Facebook and Twitter?